Google event is expected to be held on 4th Of October, where Google is going to reveal the upcoming gadgets which include Pixel 2 and Pixel 2 XL phones, apart from that Google is going to announce Google Home Mini, company’s upcoming Chromebook – Pixelbook and the new Daydream VR headset. The new virtual reality headset is likely to be called Daydream View. The headset is likely to have improved feature and will come in Fog, Charcoal, and Coral color options. The previous Daydream View had a cloth, jersey-like finish, whereas this appears to be more of a nylon or at least a material that may be able to withstand nerd sweat over a longer period of time. The design also seems a bit cleaner this time around. The controller is back again. 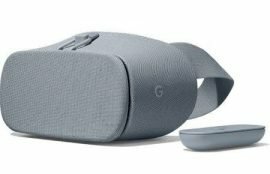 The new Google Daydream View is priced at $99, which is a $20 more expensive than the original. Once the gadget is live on the Google Store, you should be able to get it right here. Although there isn’t much information about the specs the appearance of the headsets looks better than the previous, judging from the leaked photo. The previous Daydream View had a cloth, jersey-like finish, whereas this appears to be more of a nylon or at least a material that may be able to withstand our nerd sweat over a longer period of time. Google doesn’t seem to capture the low end market as we observe the price bumps from $79 to $99, so we can expect some value addition into the product. 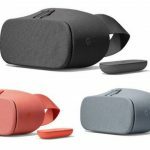 With a new design, Google has a chance to exhibit unique advantages —the portability, comfort, and versatility that Gear VR lacks. Gear VR is only compatible with Samsung devices, and pose a more formidable threat to its competitor if it steps up its hardware setup.